After my first year of college I studied abroad in Paris. I first heard about the trip in the fall and couldn't wait. By the spring, I'd fallen madly in love with a tall English major. When summer came I didn't know how I would leave him but I knew I HAD to go to Paris, I mean, when would the chance come again? I couldn't bale for a boyfriend. So I went. I emailed my tall man every day and missed him like crazy when I went to La Tour Eiffel. I ate baguette, strawberry tarts, and creme brulee at side walk cafes. I even studied a little. :) It was the best summer of my life. And then I came home, and when fall came, I married my tall man. Now it's our fifth anniversary in a few weeks and tomorrow we are going to Paris together (seriously! It feels like a dream!). It's incredibly romantic, don't you think? Really, we're just going to Paris for two days and then we're going to Greece with my family to pick up my brother. It'll be the trip of a lifetime and with an amazing romantic date. Now that's a long story for a cooking blog, but when I had my first bite of this creme brulee, all of that flooded to my mind. Post-it notes decorate my Baking book, flagging things I'm dying to make and gorgeous photos. One in particular has been calling my name since I first saw it. The perfect party cake. I finally made it last week for my birthday party. I know you don't normally make your own cake, but honestly, I don't really like cake. I never have. I just like to make them. And my friends like to eat cake. So that was a perfect arrangement. Besides, I'd never justify making this enormous, rich, and lovely cake on a regular night. With my good excuse in hand, I plopped open the book and had a great morning making it. My cake pans are a little smaller so I made two 8 inch cakes and one 4 inch, that I've tucked away in the freezer for another day. Then I worked on the icing. I've actually never made a buttercream frosting before and loved how it turned out. I was alarmed by all of the butter in the icing but it was so smooth and delicious. I might not love cake, but I do love icing. This was wonderful. I didn't have quite enough to frost the cake so I only made three layers instead of four, since I didn't have time to make another batch and didn't want to run out! I also layered in frozen black raspberries that I found at Trader Joe's. They were such a beautiful, dark color (but I hate how they kind of smeared the inside of the cake- they were too juicy!). Next time, I'll make a sauce out of the fruit instead of using whole raspberries to avoid that problem. They were so delicious, though, that it was totally worth it. All together, this cake was fun to make, moist and light- just delicious. I loved the delicate flavor with just a hint of lemon and I'm sure I'll make several variations of this great recipe. Lastly, meet my lovely new apron from icing-loving Auburn. With a pretty like that, I'm more than happy to whip up some icing for her (cake optional)! Sift together the flour, baking powder and salt. Whisk together the milk and egg whites in a medium bowl. Whisk together the sugar and lemon zest in a mixer bowl or another large bowl and rub them together with your fingers until the sugar is moist and fragrant. Add the butter and working with the paddle or whisk attachment, or with a hand mixer, beat at medium speed for a full 3 minutes, until the butter and sugar are very light. Beat in the extract, then add one third of the flour mixture, still beating on medium speed. Beat in half of the milk-egg mixture, then beat in half of the remaining dry ingredients until incorporated. Add the rest of the milk and eggs beating until the batter is homogeneous, then add the last of the dry ingredients. Finally, give the batter a good 2- minute beating to ensure that it is thoroughly mixed and well aerated. Transfer the cakes to cooling racks and cool for about 5 minutes, then run a knife around the sides of the cakes, unfold them and peel off the paper liners. Invert and cool to room temperature, right side up (the cooled cake layers can be wrapped airtight and stored at room temperature overnight or frozen for up to two months). Working with the whisk attachment or with a hand mixer, beat the meringue on medium speed until it is cool, about 5 minutes. Switch to the paddle attachment if you have one, and add the butter a stick at a time, beating until smooth. Once all the butter is in, beat in the buttercream on medium-high speed until it is thick and very smooth, 6-10 minutes. During this time the buttercream may curdle or separate – just keep beating and it will come together again. On medium speed, gradually beat in more lemon juice, waiting until each addition is absorbed before adding more, and then the vanilla. You should have a shiny smooth, velvety, pristine white buttercream. Press a piece of plastic against the surface of the buttercream and set aside briefly. Using a sharp serrated knife and a gentle sawing motion, slice each layer horizontally in half. Put one layer cut side up on a cardboard cake round or a cake plate protected by strips of wax or parchment paper. Spread it with one third of the preserves. Cover the jam evenly with about one quarter of the buttercream. Top with another layer, spread with preserves and buttercream and then do the same with a third layer (you’ll have used all the jam and have buttercream leftover). Place the last layer cut side down on top of the cake and use the remaining buttercream to frost the sides and top. I served it up with some snickerdoodles and the cinnamon went along just right. I'll post that recipe soon- they are my brother's favorite cookies and he'll be home in just a couple of weeks. I'm sure he'll want some after all this time. He's been serving a mission in Greece for our Church for the last two years and we'll be picking him up next week. I'm scrambling to get everything ready and hope to have my Dorie and Barefoot posts scheduled. But while we're hustling getting ready for our trip, I especially appreciate a quick and refreshing dessert... and using the ice cream maker one last time before the season is truly over. Enjoy! Slice, peel, and pit the peaches. Combine all ingredients in a blender and pulse until smooth. Taste, then add more lemon juice of sugar if desired. Chill the mixture thoroughly, then freeze it in your ice cream maker according to the manufacturer's instructions. Serve immediately or allow to harden in the freezer for a few hours. Before scooping, allow to soften a couple of minutes. Last week was my birthday, so instead of going out, I decided to spend the afternoon making some delicious food. And you know what? Now that I think about it, I can't remember what I made for dinner. Even so, the dessert was wonderful. We're past the season really but I had a container of strawberries in the fridge that looked perfect. Normally by the time my birthday rolls around, it's peach season, so I was happy to have a strawberry dessert this year! I've made Dorie's Strawberry Tart before and loved it so I thought I would try Ina's and see how they compared. They are very similar, especially since I added a layer of pastry cream to Dorie's tart, which is already included in Ina's recipe. The pastry came together quickly in the food processor but the instructions were a little different. Ina has you freeze all of the ingredients (even the dry) so everything is nice and cold. I might try this next time provided I'm not in too much of a hurry. Then I filled the shells with some pastry cream (I loved Ina's technique with the stand mixer and will do this again). Then I placed some strawberries in the tarts, brushed them with a little apricot glaze, and sprinkled toffee bits on top. I decorated two of the tarts with raspberries and they looked so pretty (though I'm still devoted to strawberries). In the end, I think I prefer Ina's pastry cream but with stick with Dorie's tart crust. We all thought Ina's was a little hard, but not quite cookie-like, as Dorie's is. They certainly turned out beautifully and were the perfect birthday treat. Immediately before serving, fill the tart shells with the pastry cream. Arrange the berries decoratively on top of the cream. Melt 1/3 Cup Apricot Jelly with 1 teaspoon of water and brush the top of the tarts. Sprinkle with pistachios (or toffee bits), if using, and serve. This week's Barefoot Bloggers recipe has me reminiscing. I miss the Apples and Peaches that come with Fall. I miss my dear friends in Utah who would share a box of peaches with us, go with us to the dollar theater last minute (before we had babies, you know), and I miss the smell and colors of fall- before it's cold and while it's still so beautiful. Well, Arizona has it's own wonderful time of year- Winter- and it's going to be here soon, I hope. I'll be eating oranges and lemons and everything will have a little bit of zest or juice in it. It will be a good as the Fall, if a little different. So until then, I chose Apple Turnovers to celebrate the coming of Fall. The apples came from Safeway, but baked up in a delicious puff pastry crust, they are just about as delicious as possible. Add some orange zest and juice, a few craisins (maybe cherries next time) and sharing these with new friends (while we have a babysitter for our little man) is almost as wonderful as Fall in Utah. So fork over the money for some good puff pastry (or be like me, and stalk it in the grocery store, waiting for a sale, that will come and will likely result in buying at least three packages) and make these one night with your honey. It's fun, quick, and satisfying. Even if it's still 110 outside... but that's why we have air conditioning, right? Combine the orange zest and orange juice in a bowl. Peel, quarter, and core the apples and then cut them in 3/4-inch dice (I will cut mine a little bigger next time, around 1 inch, so they stay a little firmer when baking). Immediately toss the apples with the zest and juice to prevent them from turning brown. Add the cherries, sugar, flour, cinnamon, nutmeg, and salt. Brush the edges of each square with the egg wash and neatly place about 1/3 cup of the apple mixture on half of the square. Fold the pastry diagonally over the apple mixture and seal by pressing the edges with a fork. Transfer to a sheet pan lined with parchment paper. Brush the top with egg wash, sprinkle with sugar, make 2 small slits, and bake for 20 minutes, until browned and puffed (about 25 minutes). Serve warm or at room temperature. This weeks TWD was chosen by Claudia and what a choice it was. I glanced at the recipe and noticed that there was only 1/3 a cup of flour in the whole batch and there is an alarming amount of chocolate- bittersweet chocolate, cocoa powder, semisweet chocolate, white chocolate, and milk chocolate (did that remind anyone else of the quintuple chocolate brownies?). Toss in a generous portion of nuts (I chose pecans) and some raisins (cherries in my case) and you don't even need flour! Well there was a bit, but as I was making these I knew they would be delicious with so much chocolate. The dough came together quickly and I planned to bake them right away but had to leave a little early, so I stashed it in the fridge. I came home a couple hours later, got the bowl out, and came back to it a bit later to find a brick of chocolate. It was so hard that even after I let it sit in the Arizona sun all morning it was still hard as a rock. So, I set up a little double boiler and took out my ice pick and worked at it until I could get the bits crammed into a baking dish and kind of smoothed out. I'll admit at this point I had a stomach ache from testing the chunks I kept prying off. I baked it for about 30 minutes at 350, let it cool for 15, and inverted it onto a cooling rack. I chopped them into "brownies", ate one, and promptly packaged up the others to send off to work with my husband and to my skinny cousins's houses. These cookies were good. Next time I feel like burning through a few pounds of chocolate I will make them again... and be sure to scoop them right away! You can find the recipe at Madam Chow's Kitchen. 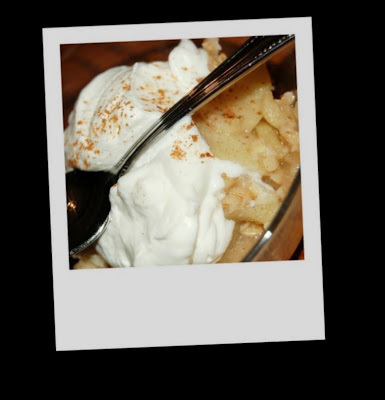 A few weeks ago I went to lunch at my cousin Kristi's house and she served the most wonderful apple crisp. She raved about how simple and easy it was to make and we raved about how delicious it was, too. Naturally I asked her for the recipe when I realized that I had bought about four times as many apples as I needed for the Barefoot Blogger's Apple Turnovers. This came together in a flash one afternoon earlier this week, thanks mostly to my handy apple peeler and corer. If you don't have one, peel the apples with a paring knife or vegetable peeler, cut into quarters, and chop into 1 inch pieces. I made a few "Anne" modifications- a little lemon, a little extra cinnamon, and not quite as much nutmeg. I also reduced the topping by half since I figured with a little less "crisp", this is nearly a healthy dessert. Well fine, my judgment in that area has been more than impaired by Tuesdays with Dorie. I do think, however, that this quick and inexpensive dessert is practically healthy, and totally delicious. Plus, calcium has been shown to help with weight loss, so don't forget to include some whipped cream or ice cream on top. Combine all ingredients in a large bowl and toss gently. Pour into a medium baking dish (9 x 9 or 9 x 11 for example). Combine all ingredients with a pastry cutter or two forks (even your fingers will do in a pinch) until the butter is incorporated in small pieces. Pour topping over the apples and bake from 35-45 minutes at 350. Serve warm with whipped cream or vanilla ice cream. In the end, I think I would have preferred a little more sauce and a little less noodle, but I loved the bacon and the basil in the pasta. The flavor was amazing and it's always fun to try a new pasta dish. Next time, I'll include a little grated onion with the roux and maybe try adding some fontina. And I'm sure, whatever recipe I use, I'll include some bacon and basil! Place a baking rack on a sheet pan and arrange the bacon in 1 layer on the baking rack. Bake for 15 to 20 minutes, until the bacon is crisp. Remove the pan carefully from the oven - there will be hot grease in the pan! Transfer the bacon to a plate lined with paper towels and crumble when it is cool enough to handle. Meanwhile, heat the milk in a small saucepan, but don't boil it. Melt the butter in a medium pot and add the flour. Cook over low heat for 2 minutes, stirring with a whisk. While whisking, add the hot milk and cook for a minute or 2 more, until thickened and smooth. Off the heat, add the Gruyere, Cheddar, blue cheese, 1 teaspoon salt, pepper, and nutmeg. Add the cooked macaroni and crumbled bacon and stir well. Pour into 2 individual size gratin dishes. Last week was my husband's birthday so we celebrated in typical fashion- lots of family, food, and babies running around. For the party, I made one batch of Dorie's brioche into two pans of Pecan Honey Sticky Buns. I'm glad I made two plates because everyone ate one as an appetizer while we waited for the grill to heat up. Thankfully there was another batch to turn into the cake later on! Then, for his work party, I made Dorie's Banana Cream Pie and a Florida (Key Lime) Pie. I was watching my niece (of Blueberry Pie fame) when I made those so I don't have process pictures, but let me assure you they were delicious. The Florida pie is refreshing and tangy. I love putting whipped cream on top for the perfect compliment to the citrus. As for the banana cream pie, Dorie based the recipe off of her original pastry cream with a few things added. Since I'm all for pastry cream, I loved this pie. It was creamy, flavorful, and a cinch to put together. I loved the sour cream in the topping, too. It was subtle and perfect. I do have one complaint about all three of these recipes. They don't come with someone to wash the dishes. I have a feeling, though, that with the promise of one of these for dessert, nearly anyone would commit to washing a few dishes for you. Whisk in the vanilla extract. Let sit for 5 minutes, then whisk in the bits of butter, stirring until they are full incorporated and the pastry cream is smooth and silky. You can either press a piece of plastic wrap against the surface of the cream to create an airtight seal and refrigerate the pastry cream until cold or, if you want to cool it quickly--as I always do--put the bowl into a larger bowl filled with ice cubes and cold water, and stir the pastry cream occasionally until it is thoroughly chilled, about 20 minutes. (If it's more convenient, you can refrigerate the custard, tightly covered, for up to 3 days). When you are ready to assemble the pie, peel the bananas and cut them on a shallow diagonal into 1/4 inch slices. Whisk the cold custard vigorously to loosen it, and spread about one quarter of it over the bottom of the pie crust- it will be a thin layer. Top with half of the banana slices. Repeat, adding a thin layer of pastry cream and the remaining bananas, then smooth the rest of the pastry cream over the last layer of bananas. Working with a stand mixer fitted with the whisk attachment or with a hand mixer in a large bowl, beat the cream until it just starts to thicken. Beat in the confectioners' sugar and vanilla and continue to beat until the cream holds firm peaks. Switch to a rubber spatula and gently fold in the sour cream. Spoon the whipped cream over the filling and spread it evenly to the edges of the custard. Serve, or refrigerate until needed. What a fun Tuesdays with Dorie- I love cookies! They are the first things I ever really baked and probably still my favorite (aside from a good french tart!) My husband loves oatmeal cookies and eats peanut butter out of the jar so he was pumped about this recipe until he realized there was chocolate chips included. Since he can't have chocolate, I subbed in Reese's Peanut Butter chips for half of the dough. In the other half, I included mini chocolate chips and mini Reese's Peanut Butter cups. Wow! They were yummy... and even the non-chocolaty version was tasty. I did omit the spices since I was primarily making these for my mom and she doesn't like them in cookies. All in all, these had great reviews from all of my tasters and were a fun, simple cookie to make. Another winner by Dorie. What can I say, I love this cook book! Thanks for the great choice Stefany (you can see the recipe on her blog)!